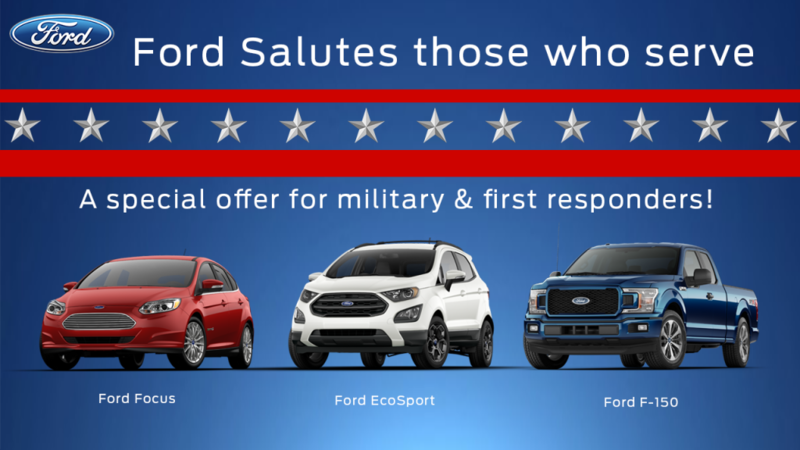 Ford Motor Company is grateful to you for your honorable service to our country and would like to salute those who serve. That’s why we’re proud to offer you and your families a $500 Bonus Cash Offer! This exclusive offer is good toward the purchase or lease of an eligible new Ford vehicle. All 2015/2016/2017 Ford Vehicles are eligible for this promotion. This offer is not available on Mustang Special 50th Anniversary Edition, Shelby® GT500®, Shelby GT350®, Shelby® GT350R, Boss® 302, Focus RS and Raptor. All verification must be completed through the Ford Salutes Those Who Serve site, by clicking on the “Register for Your Offer” link. This will route you to the verification partner ID.me. Verification process typically takes less than a minute. The Servicemembers Civil Relief Act (SCRA) is a federal law that provides certain benefits and protections to qualified servicemembers. Get all the details and FAQs with this offer. Find out if your eligible for this Military incentive. Questions? Ready to Shop? Get In Touch Here.